Do you prefer feeling your way into putting puzzles rather gradually, or are you looking for a very special gift for someone, who probably will not be able to spend too much time or effort to put a customized jigsaw puzzle? In that case, we recommend our easygoing premium jigsaw puzzle. 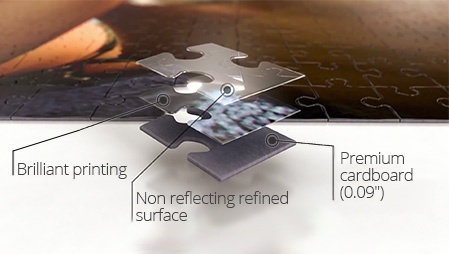 With this boxed photo puzzle, you will have an original way to let your photo come into play. Our 100 pieces jigsaw is the ideal entry into the world of customized photo puzzles. The best thing of all is that you get a customized photo puzzle with the highest quality for quite a low price. Did you know that these 100 puzzle pieces are being cut from the same size cardboard that is being used for the 200- and 500- pieces photo puzzles? This is the reason why this easygoing 100 pieces personalised jigsaw has the largest pieces of them all, which makes completing the photo puzzle not that difficult anymore, even for unpracticed hands. 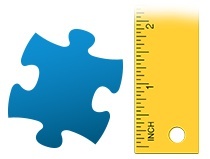 This means lots of fun for those who do not have any experience with putting jigsaw puzzles. 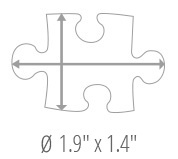 The photo puzzle comes with separated pieces collected in a polybag and put into the selected puzzle box.